Pallet Flow and Carton Flow is a pallet racking system also designed for depth space; it uses a slightly inclined conveyor that makes pallets or totes move easily along a sloped plane. These systems are also called gravity flow or dynamic flow racking systems. 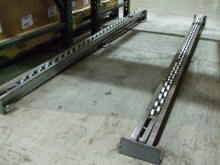 The pallet flow system often has complex motion and braking systems to control the speed of the moving pallet.